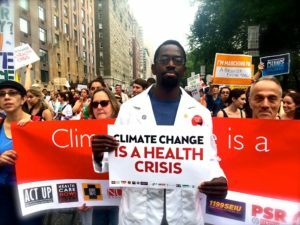 The Center for Climate Change and Health is excited to share its newest resource, A Physician’s Guide to Climate Change, Health and Equity. In partnership with the California Medical Association Foundation, the Network of Ethnic Physician Organizations and the National Medical Association, we’ve created this guide to strengthen and inform the physician voice on climate change, health and equity. It covers basics of climate change, health equity and physician experiences with these issues, and dives deeper into specific climate change and health impacts and co-benefit solutions. It also includes special focus topics, such as how climate change affects children, pregnant women and workers. migration and conflict.